1. Write what you know about, you can waste valuable time and effort spending hours on a topic that appears lightweight and inaccurate. 2. Keep your posts short, punchy and concise, use as few words as possible to put your points across and use white space as breather points that allow readers to pause, but still remain interested. Use a photo with a descriptive title to illustrate what you are writing about. 3. Try not to patronise, you want to share your knowledge and views but don't ram it down your viewers throat. Stimulate a debate. You are really winning if someone feels comfortable in responding in the comments section at the bottom of your post. 4. If you get something wrong don't hide it, correct it quickly and if it is pointed out by a commenter, thank them. You want your audience to know you are 'only human'. 5. If you are writing about a project as work in progress, make sure you update the blog regularly. If you add ten 'before' photos on day one of the project but fail to add or even take any further images until you are over half way or when the project is complete, your audience (or potential customer) will lose interest. They want to see how you are doing, how efficient you are and how you combat problems along the way. 6. Organise your site to look balanced and appealing. If you are hoping to add to your income by inserting Google Adsense code then put it in a prominent position. Blend the colours of the ads so that they appear part of your site. Google ensures that the viewer is always aware that it is advertising but you are giving them the option to research further by looking for related adverts. Bear in mind that if you are selling yourself as a service or a product, using adverts can distract potential clients and you could even send them elsewhere without engaging with you. 7. If writing about a current work project on a blog, Google and other search engines indexes the pages and words on your site. Try to ensure that you you utilise the right keywords so that search engines have enough 'juice' to find your content and send interested searchers to your site. 8. What ever you do, update regularly. There is nothing worse than leaving a blog dormant for weeks. Readers and potential customer will get bored. If you have a digital camera then use it - a picture tells a thousand word (don't forget the image title). Editing is easy with MS Paint or an on-line editing photo editing software like Picnik or something more powerful like Adobe Photoshop. 9. Add local place names which relate to what you are doing. If you are a landscaper or gardener in Hampshire and wish to attract enquiries within a certain radius then write about places, suppliers or events in that area. 10. Enjoy your blogging as much as your day to day work. If you consider your on-line diary as a chore after a busy day, then it will be reflected in your writing. Avoid sentences like: 'It rained today so we finished early' because it is not inspiring - pack it out a bit and consider how you can make the most mundane and uninspiring things engage your readers and keep them hooked. Add a photo for fun of the rain dripping into a bucket full of water for example. OK I have exaggerated a bit but hopefully the point is there. Always bear in mind that your blogging diary is an extension of your work ethic, creativity, professionalism and personality. Does anyone have any recommends on accounting software for a landscaping company? Good tips. I like blogging about gardening because you can combine photography with gardening; two things I love to do. Tejvan - Thanks for your comment and I like your blog - it is very rewarding isn't it? A really nice piece of work - really helpful to someone like me who is just starting out. FranceVerte, c'est l'annuaire officiel des professionnels et administrations de la nature et de l'environnement qui répertorie plus de 150 000 établissements spécialisés et unique en france:jardinerie, paysagiste, pépinériste, horticulteur, fleuriste, motoculture de plaisance, forestier, engrais et fertilisants, matériels de jardin..... Et toute activité professionnelle et administrative liée au monde des parcs, jardin et des espaces verts. I'm getting conflicting advice which to have. Hi Neil, I'm not sure why you would want to keep things separate, just be clear that this is the blog and this is the service/product I offer. Then use the blog as a way to connect with readers and the wider gardening/landscaping community which will raise your profile, but also provide insight and ideas into your own endeavours. And of course, link the two together. I read an interesting article about how commercialism has shifted the traditional blog - in other words personalised musings and closer to hope content - to a more corporate approach with many 'blogs' becoming magazines now and lost much of the original personality that made/makes them appealing. 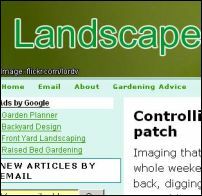 Thanks for the hints and tips, its really help full for starting out a garden design blog.